Recover process solutions and rinse water for reuse wherever possible. Purify and Recycle the waste stream at the source, rather than end of pipe. Convert formerly hazardous waste to a recoverable raw material. Reduce non-recoverable waste to a manageable volume for off-site disposal. Offer flexibility and reliability with a minimum requirement of maintenance. Atmospheric and Vacuum Evaporators for drag-out recovery and waste concentration. Resinator ion exchange for recycling dilute rinsewaters, reducing water flow. Automatic Batch Treatment modules for treatment of concentrates or metal reclaim (as pure hydroxides). MicroMagic Microfilter Systems, compact design with pH and temperature impervious graphite membrane to extend cleaner life by removing oily contaminants. Microfiltration Systems for metal hydroxide removal to meet strict standards and filter effluent for RO recovery. 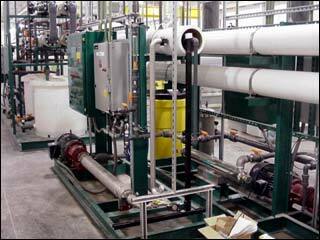 Reverse Osmosis (RO) Systems to recycle up to 90% of water used providing low conductivity rinse water. Acid Recovery Systems to maintain pickling efficiency by removing dissolved metals and returning active acid to the process while reducing treatment costs. Electrowinning Units, for plating metals from drag-outs and evaporator concentrates, reducing hazardous waste volume. Coalescers to separate floating oil from effluents reducing waste volumes and improving effluent treatability. No one technology or system will be optimum for every application. Our modular systems approach offers proven technologies uniquely applied to individual situations to give the metal finishers optimum flexibility, performance, and reliability in implementing a 0-discharge program tailored to their needs. Aqualogic also offers complete turnkey design and engineering services, including our in-house laboratory, integrating the above equipmentto assure that the project for each facility meets the objectives, is correctly installed, and is completely operational. This includes accessory support equipment, including lift stations, rinse transfer systems, pH and ORP controllers, and other solution monitoring and handling equipment which are used to balance the system and assure smooth and reliable performance. Our finishing engineers will often recommend additional rinse stations where feasible to allow the system to operate most efficiently without creating excessive effluent volumes for treatment or disposal.